Welcome to Episode 6 of Four Questions – a weekly podcast where I answer four questions about my husband’s aspiring indie rock band, Learson Peak. My name is Michelle Learson and I'm your host. This episode came out to be VERY LONG, so I will be releasing a 2-part blog. In Part 1 , I will recap our experience at Boston Calling. In Part 2 I will move on to answering the four questions about Learson Peak as promised. If you don't want to wait until the written version comes out, you can hear the whole thing on the podcast recording above. Boston Calling is the largest outdoor music and arts festival in New England spanning three days – Friday, Sat and Sunday every year over Memorial Day Long weekend. The festival was launched by Brian Appel and Mike Snow (not the musician) in 2013, and the music is curated by Aaron Dessner from the band The National. In 2016, The Madison Square Garden Company (NYSE: MSG) purchased a 51% controlling stake in the festival (valued at US$14 million according to a Bank of America equity research) and moved it from downtown Boston to the Harvard Athletic Center, which – lucky for us - is right next door to where we live. After attending all three days, I wanted to share with you my thoughts on the three biggest surprises from the event. Unfortunately we didn’t get to see all the acts as Stephen performed at after-parties on both Friday and Saturday night. When Annie Clark (a.k.a St. Vincent) stepped out onto the Green Stage on Saturday afternoon, I could feel the eager crowd's eyes pop out of all sockets. Her stage costume was incredibly flashy - she wore a bright red-orange one-piece with matching over-knee boots and elbow-length gloves. Overall St. Vincent's performance this year was highly theatrical - with a vivid video backdrop of Annie's head undergoing various transformations. As usual, Toko Yasuda (guitar, bass, syths, vocals) joined Annie on stage in much simpler attire and long braided pigtails and metallic green mini-shorts. 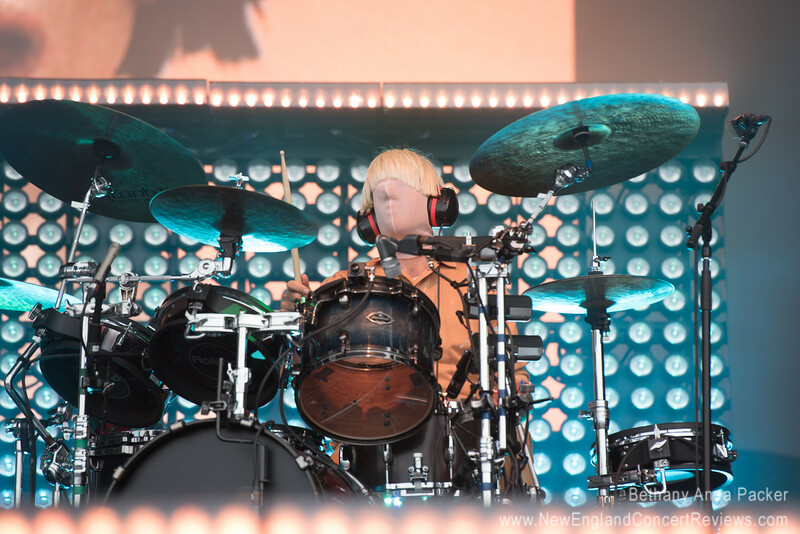 I was also surprised by the costumes of the two additional anonymous band members on keys and drums - who wore blonde wigs and stocking-mesh face masks. Annie's guitars deserve some mention. For each song, she strapped on a different neon color of her signature Ernie Ball Music Man guitar, switching from red to yellow to blue and white. Compared to the last performance I saw of her at Boston Calling in 2015, this show seemed to be so much more focused on the overall aesthetic of the band rather than Annie’s guitar chops. She’s definitely evolving. I feel like she’s saying to me – you know I can play guitar, so why don’t we experiment with something different now? I had never heard of or seen The Decemberists before. They are a "baroque pop" band from Portland, Oregon that formed in 2000. Truthfully, their show didn’t start out great for me. After trekking all the way to the Blue Stage in the cold rain, my first impression of the band was that they sounded like an old Irish family’s square dancing party. But after getting a glimpse of wonder woman Jenny Conlee - I came around. Jenny plays synths, organ, accordion, mellotron, and glockenspiel for The Decemberists. Quite the multi-tasker! In a very different way to Annie Clark, Jenny is immediately captivating. Despite the fact that her keyboard setup was completely covered in plastic to shield from the blistering rain, Jenny's energetic stance, short black-spiked hair and spicy red lipstick made her an intriguing musician to watch. I learned later that she has been battling breast cancer since 2011. And lead singer Colin Meloy wasn't bad either. He kind of reminds me of Rivers Cuomo from Weezer (Boston Calling 2017). I’ve seen Thundercat before at the Paradise Rock Club in Boston – I didn’t get it the first time. Their melodies are abstract. Very few vocals. Some dude is on stage playing a whole lot of bass notes, singing occasionally and wearing basketball shorts and sandals. Going into the Thundercat set at Boston Calling – I knew that this show was going to be way too complex for me. Maybe "acid-jazz" music is not my thing. To my surprise, in the misty haze of late Sunday afternoon, Thundercat’s powerhouse trio (Stephen Lee Bruner, Dennis Hamm, Justin Brown) held my full attention. They are obviously professional and talented musicians, but what really drew me in was Dennis Hamm's secret smile. They call him Hamm Solo (side note - the new Star Wars movie wasn't that great - no need to rush to the theaters). Every time Thundercat played faster and harder - Dennis (the keyboardist) would have this wry smile on him, as if there was something going on in the music that only he and Thundercat shared - an inside joke. At many points during their set it felt like they were just jamming and having a great time, and not really caring about the audience at all. It was delightful to watch them really enjoy what they do for a living. So there you have it - the three biggest surprises of Boston Calling 2018! I was pretty bummed that I didn't get to see Paramore, Jack White, The Killers, or Kahlid - if I had caught their sets I might have written about them. I did make an effort to catch the headliner of the festival - Eminem – who recently released his 9th studio album Revival in December 2017 - to mixed reviews. Personally I didn’t really like the album – even though it was produced by Rick Rubin and featured Ed Sheeran, Beyonce and Alicia Keys. I was thankful that Eminem performed many of his classics, including Stan, Lose Yourself and The Way I Am. Brings me back to high school when I used to listen to Marshall Mathers on repeat. Last year the headliner was Tool which I thought was way better musically and aesthetically, but Eminem did bring out a pretty crazy production army, including a full blown symphony orchestra, fireworks. He tried really hard. I appreciated that. What I absolutely did not appreciate were the gunshot "sound effects" that Eminem blasted into the audience. It scared the hell out of me - NOT FUNNY! Up next in Episode 6 Part 2 - I answer Stephen's four questions and share some drama about our upcoming Learson Peak shows next week. Again, If you don't want to wait until the written version comes out, you can hear the whole thing on the podcast recording above.